Constructed from a 250Vdc (6µm) rated film the component is spindle wound. It is then given a special heat treatment before the insulated copper terminals are hand soldered to achieve the best possible connection. The inherently low dissipation and dielectric absorption factors of polypropylene allied with an excellent mechanical stability results in an extremely detailed sonic performance. The construction also results in a low self inductance and ESR (Equivalent Series Resistance) and the devices are highly stable with regard to temperature and frequency. As with all ClarityCap products tape and resin colours are flexible. 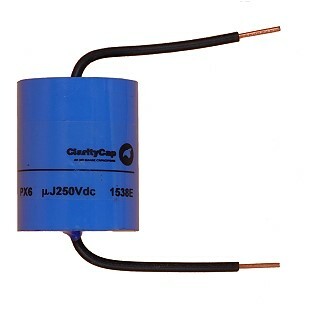 Unless otherwise specified PX capacitors are supplied with blue tape and blue resin.